After losing about $2 billion more than a week ago on Facebook‘s second trading day as a public company, CEO Mark Zuckerberg came out of the three-day weekend to witness another precipitous drop in his fortune. According to Forbes’ Real-Time Billionaires list, the value of his stake in Facebook plunged $1.5 billion to $14 billion after the company’s share price fell below $30 on Tuesday. Facebook’s stock closed down 9.6% at $28.84. 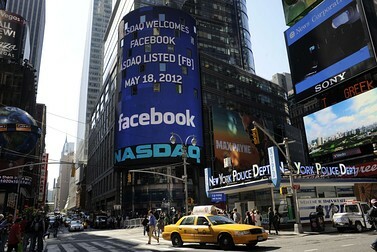 Since Facebook’s stock debuted on the Nasdaq on May 18 with underwriters selling shares at $38, it has dropped 24.1%. Yes, endangered. The number of public companies has declined 37% since 1997. The number of IPOs has dropped from 311 annually before 2000 to 99 in the past decade. Meanwhile, the smart CEOs and the Super Rich are “going private,” to avoid government red tape restricting capitalism. Over at BusinessWeek they’re warning investors that the growing number of “cutesy mascots” is a dangerous reminder “of the dot-com boom’s irrational exuberance.” They’re also red flagging new reports that “more Chinese investors are betting on U.S. start-ups.” And feeding the flames. Facebook shareholders have sued the social network, CEO Mark Zuckerberg, and a number of banks, alleging that crucial information was concealed ahead of Facebook’s IPO. Earlier this month, Facebook updated its filings with the Securities and Exchange Commission to say that the shift to smartphones and other mobile gadgets is cutting into the prices it can set for advertisers, which would in turn hurt the company’s revenue. In March, the social network had 488 million monthly average unique users of its mobile products, out of a total of just over 900 million registered users. 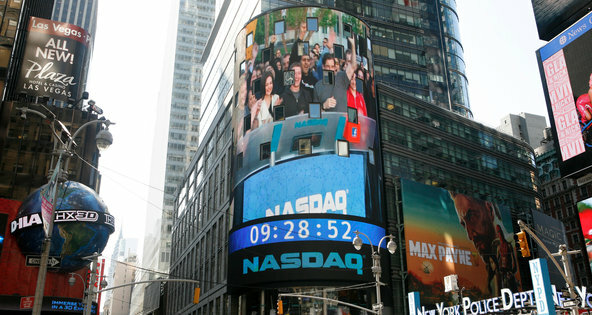 Nasdaq’s sign carried live video of Mark Zuckerberg ringing the bell from Menlo Park, Calif.
Friday should have been Facebook’s day to shine — and Nasdaq’s as well. 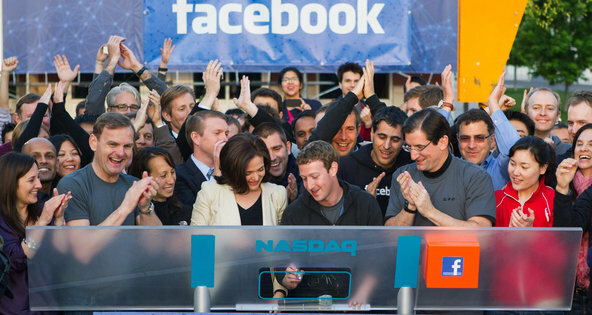 Investors and the media from around the world were waiting for 11 a.m., when shares in Facebook would finally begin trading on the Nasdaq stock market. 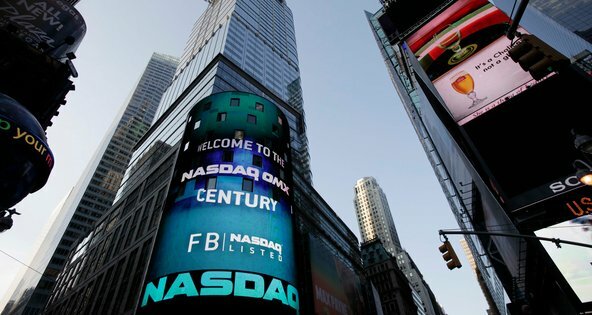 At $16 billion, it was one of the biggest initial public offerings ever held in the United States, and the largest by far handled by the exchange. Facebook CEO Mark Zuckerberg is hoping to use the power of his 900 million member social networking platform and peer pressure to convince people to become registered organ donors. Starting Tuesday, Facebook users living in the U.S. and U.K. can add an organ donor status to their Facebook profile and post it publicly to their Timeline. Zuckerberg says the inspiration behind Facebook’s organ donation push comes from COO Sheryl Sandberg and Dr. Andrew M. Cameron, a transplant surgeon at John Hopkins Hospital in Baltimore. Zuckerberg attended Harvard with Sandberg and together came up with the idea after meeting at a college reunion last spring, according to a John Hopkins press release. Zuckerberg early Tuesday told the ABC new program Good Morning America his girlfriend, Priscilla Chan, who is studying to be a pediatrician, was also an inspiration. Users living in the U.S. and U.K. that want to become donors can use the new feature to sign-up with their respective organ donor registries. Facebook’s announcement follows reports from late Monday that the social network was getting ready to release a new life-saving tool. If successful, Facebook’s organ donor push has the potential to help save the lives of the more than 114,000 people in the U.S. currently waiting for new kidneys, lungs, hearts, and other organs. Courtesy ABC’s GMAIn an interview GMA co-host Robin Roberts asked why organ donation? Zuckerberg said that he was impressed by the way communities hit by tragedies such those recently in tornadoes Missouri and in Japan used Facebook to organize and find family. Mark Zuckerberg, Facebook’s 28-year old founder and chief, has found himself in a rare and enviable position. Now that his social network has been valued at $100bn, he can comfortably afford to wipe out any of its competitors with large purchase prices and lots of change to spare. Instagram, with its 30 million users, the majority of which are young, (compared to Facebook’s ageing membership as its popularity grows amongst parents and grandparents) has been scooped up by Facebook for a mere one per cent of its market cap. The move heralds a new era for the social network. Zuckerberg has personally pledged to not only keep the photo-sharing app open; he has said it will continue to work with other rival social networks, such as Twitter and location-sharing service Foursquare. Using his own Facebook profile to announce the deal, which is the first of its size for the social network, Zuckerberg stressed that it would be business as usual for Instagram’s 30 million users: “We need to be mindful about keeping and building on Instagram’s strengths and features rather than just trying to integrate everything into Facebook.